Scientists and photographers from around the world will have the opportunity to share their scientific research, discoveries and observations of natural wonders with the launch of the collection phase of an international images exhibition scheduled for Rochester Institute of Technology in 2019. 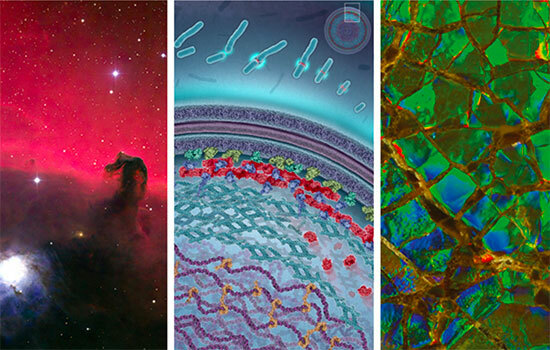 The exhibition is being led by Michael Peres and Ted Kinsman of RIT’s School of Photographic Arts and Sciences, along with Norman Barker of Johns Hopkins Medicine—each of whom has enjoyed award-winning careers as photographers, but also as authors, teachers and industry leaders exploring and making science images. Because of their passion for the image in science, they are coordinating the production of the third in a series of traveling exhibitions exploring the diverse field of the image in science. "Images from Science 3" (IFS 3) is being organized to build upon the successes of the Images from Science 1 and 2 exhibitions, held previously in 2002 and 2008, respectively. “Much has changed in the world of science, technology and explorations in the decade since those exhibitions were mounted, including the explosion of new applications of imaging technologies,” said Michael Peres, associate chair of the School of Photographic Arts and Sciences (SPAS). Peres and Andrew Davidhazy, professor emeritus in SPAS, were the original creators of the project. IFS 3 invites both new and recognized image makers who reveal science in photographs to participate in this latest collection of work. The exhibition’s goal is to produce “a traveling exposition that features extraordinary examples of still and moving images, animations and illustrations produced to explore or document a scientific process,” said Kinsman, an assistant professor of photographic sciences at RIT and a third organizer. Seven international judges will curate the final collection of images, videos and illustrations, Kinsman noted. IFS 3 has a number of sponsors helping provide support for the project using technology to solicit, judge, invite and display the technical excellence and creativity needed to make such photographs. In addition to RIT and Johns Hopkins University, sponsors include Carl Zeiss Microscopy, headquartered in Jena, Germany; RIT’s Chester F. Carlson Center for Imaging Science; SPAS; RIT’s School of Art; Science Source Images in New York City; and Service Photo in Baltimore, Md. A four-color catalogue will be published by the RIT Press. The exhibition will premiere at the new RIT City Art Space in November 2019 and will then be displayed at Johns Hopkins in January 2020. The exhibition is being dedicated to Lennart Nilsson, the late Swedish photographer and scientist noted for his photographs of human embryos and other medical subjects once considered impossible to photograph, and more generally for his extreme macro photography. "Images from Science 1" premiered in the fall of 2002 at RIT. Launched at the infancy of the internet and digital photography, it featured 59 photographs and traveled to 22 venues in seven countries until it was retired in 2007. "Images from Science 2" premiered in the fall of 2008 and was displayed in 13 venues before it was lost in shipping from the U.K. to the Netherlands in 2014. Both exhibitions were produced as experiments to explore the power of the internet as the sole tool used to promote, identify and ultimately display some of the world’s most powerful photographs of science at the time of their production.